For all those who obsess over a squeaky clean mobile phone screen, Japanese smartphone maker Kyocera has devised just the perfect solution. The company’s brand new mobile phone christened ‘Rafre’ can actually be scrubbed clean with hot water and soap! 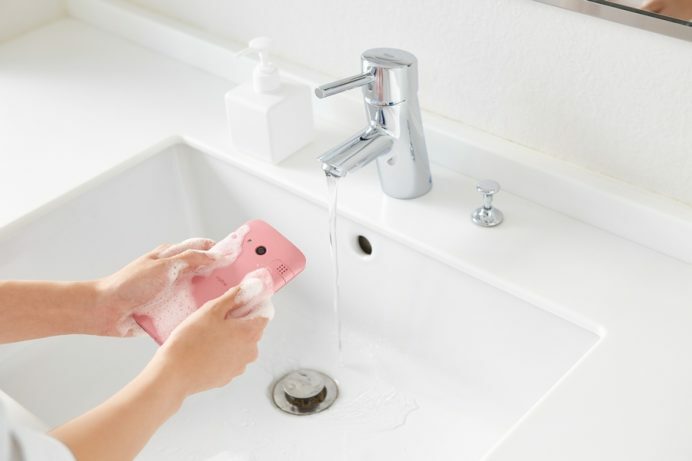 Rafre is the latest development after its predecessor – another handset that also could be washed, but only with particular kinds of hand soaps. The new Rafre however is accepting of a wide range of soaps, foaming body washes and hand soaps included. In addition, this washable smartphone has a cooking app too, which can be controlled using hand gestures only, thus eliminating the need for a soapy scrub. The only hitch at the moment is that this wonder phone will be available only in Japan, via service provider KDDI.